Topaz Systems was founded in 1990 as a company exclusively focused on electronic pen and sensor technology for handwriting and signature input to computers. Thousands of businesses across the world are saving time and money by replacing paper processes with electronic signature and document solutions. For unmatched versatility, security, and value, Topaz Systems' technology is the best choice for your business e Commerce needs. SigLite 1x5 - USB signature pad is a low-cost pressure-sensitive electronic signature pad that features all the high-quality biometric and forensic capture techniques of a SignatureGem tablet but with a low-cost touchpad and stylus. SigLite LCD 1x5 - USB includes all the high-quality capture features of a electronic signature pad with the added feature of an LCD allowing users to see "electronic ink" under the pen tip as they sign. SigLite LCD Backlit 1x5 - USB includes all the high-quality capture features of a electronic signature pad with the added feature of an LCD allowing users to see "electronic ink". ClipGem Letter - USB electronic clipboard is a letter sized electronic signature capture clipboard for use wherever one party desires a paper copy or receipt in addition to an electronic copy. Thin and lightweight. SignatureGem LCD 1x5 - USB includes all the high-quality capture features of an electronic signature pad with an LCD interactive display, allowing users to see "electronic ink". 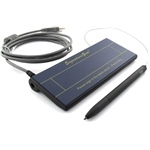 SignatureGem 4x5 - USB is a durable large-sized electronic signature pad with digitizing pen. The pen features interchangeable inking and stylus tips and the pad is powered only by the computer's data port. SignatureGem LCD Backlit 1x5 - USB includes all the high-quality capture features of an electronic signature pad with an LCD interactive display, allowing users to see "electronic ink". 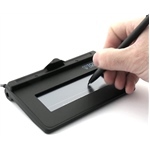 SigLite 1x5 - Serial signature pad with SigPlus Pro Software is a low-cost pressure-sensitive electronic signature pad that features all the high-quality biometric and forensic capture techniques of a SignatureGem tablet but with a low-cost touchpad and stylus. ClipGem Legal - USB electronic clipboard is a legal sized electronic signature capture clipboard for use wherever one party desires a paper copy or receipt in addition to an electronic copy. Thin and lightweight. 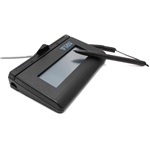 SigLite Slim 1X5 - USB is a slim low-cost electronic signature pad that features all the high-quality biometric and forensic capture techniques of a SigLite tablet but with a thin 0.20'' profile for extreme portability. The SigGemColor 5.7 - USB is an advanced biometric electronic signature pad with 5.7 inch, full-color TFT VGA (640 x 480) LCD that captures and displays "electronic ink" under the pen tip for a natural signature.